Over the past year I’ve been gradually migrating all my hardware from home-built linux boxes to Macs (Mac Mini’s specifically). I’m still keeping my separate MythTV frontend/backend setup. I’m using a Mini as my backend in the office, and a Mini as my frontend in the family room. I’m going to do a couple different posts, describing my frontend configuration, and my backend configuration. Each has it’s own interesting twists, but overall, I wanted to get back into my blog, and try and help folks who might be going down the same path (going Apple). I haven’t been able to resize the screen to non-native resolutions without getting skippy playback. Which means.. overscan.. and lots of it. The mac remote has 6 buttons (3 are overloaded, so there are really 9). That’s enough for 95% of the everyday use, but not for more advanced tasks. As I mentioned above, the possibilities are broad and wide when it comes to now integrating MythTV with other Mac multimedia apps. Here is a short list. As I begin putting all this together into one monster media machine, I’ll make sure to document the pitfalls, how-to’s etc… along the way for anybody who wants to go down this path. Our Music Worship Team at church uses OpenSong, opensource Worship Planning software, but one of my frustrations has been that it’s music editor is not the best. I’ve also been getting a bit deeper into TextMate; more specifically, bundles. I’ve recently put together an OpenSong bundle which primarily allows for better syntax highlighting, but also has a ‘new file’ snippet for creating a new OpenSong file. It’s a work in progress, so as I modify it, I’ll be sure to keep it updated. As I had mentioned in a preview post, I’ve been working on a mac mini MythTV frontend. The only current issue I have is streaming HD content over 802.11n. My first attempt worked great as long as I didn’t move the mini to a different room than the router. I’m learning a bit more about wireless networking as I go along here, essentially, my ‘old’ router operates in the 2.4 Ghz range which is significantly more crowded than the 5 Ghz range, so I’m going to test out a 5Ghz router this weekend, and see what I can get. Another possibility is to transcode the HD to SD (which is the quality I would be viewing it anyway) and stream that. I don’t want to outright replace my HD content (I still watch it in HD downstairs afterall), so I might set up a User Job to transcode it, and place an entry in the MythTV database for a ‘second’ show. Well, it seems in Apple’s infinite wisdom that they’ve dropped support for analog video in the newest mini. After pounding through forums and what-not, I’ve discovered the same issue exists for the macbook pro’s as well. Unfortunately, that will lead me to the purchase of a VGA -> S-Video adapter. More on that later, as I continue my quest for a turnkey MythTV frontend. As I mentioned in a previous post, I moved my blog from my own host, to Google’s blogger. As a result, there are ~ 100 old blog posts that are linked to from all over the place and I’d like to have a graceful way to re-direct. The previous post mentioned updated the header with a 301 redirect. Going through so many old posts, and updating each one was nuts, so I wrote a small ruby script to handle the duties. I’ve finally gone and done it. I’ve purchased a new mac mini for an upstairs MythTV frontend. MythTV runs well on Mac OS X so I figured I’d give it a shot. I’ve never experienced anything quite as easy as this. The Mac Mini is the *perfect* MythTV frontend. I’ve unboxed (always fun with Apple products), plugged it in, gone through initial Leopard setup, and downloaded the precompiled dmg from The Snider Pad. I have my backend broadcasting itself as a UPnP Media Server, so when I fired up Mythfrontend.app on the mac for the first time, it found it right away. Once it connected, I was done. There were all my shows. Of course, the first thing I did was go straight to some of my traditionally difficult HD content, and it played it back flawlessly. This was such a pleasant experience and the mini is soooooooooo silent that I’m counting the days until my monstrous 4 year old media PC dies in the family room! Another project might be to figure out what the most compatible tuner’s are for a mac and kill my loud backend in the office. I’ve been impressed with MythTV on a Mac OS X. I hope to write some apple friendly applescripts/automator actions to do some fun things that I’ve been dying to do. I’ve been moving my blogs around a bit the last couple days, and the thought occured to me that I have years of posts that are still generating pretty significant traffic to my blog. How can I update the ‘old’ urls so that they 1) redirect the person who runs across an old link and 2) tell google to update my link in their search results and keep my rank. That little dandy replaces every page that I want re-directed. Now… wouldn’t it be nice to write a little ruby script to go through my 100 posts and update each one! 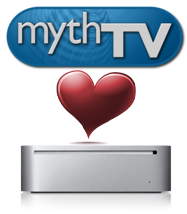 The new mac mini has been released, and we’ve decided to go ahead and use it for a second frontend for the MythTV backend. Not that we’re big TV watchers, but having a second frontend upstairs gives us a chance to hole up upstairs when sick/etc… and watch the same programs as downstairs. We’ll see how streaming HD over 802.11n goes!